In the year 1955 a biological experiment took place in the Czechoslovakia with the crossing of a German Shepherd Dog with a Carpathian Wolf. The experiment established that the progeny of the mating of a male dog to a female wolf as well as that of male wolf to female dog, could be reared. The intention was to create a dog that would be a perfect working dog, possessing greater endurance, greater intelligence, a better sense of smell and better protection skills then any other dog then used for working purposes. The overwhelming majority of the products of these mating possessed the genetic requirements for continuation of breeding. In the year 1965, after the end of the experiment, a plan for the breeding of this new breed was worked out. This was to combine the endurance and intelligence of the wolf with the favorable qualities of the German Shepherd Dog. In the year 1982, the Czechoslovakian Wolfdog, through the general committee of the breeder's associations of the CSSR of that time, was recognized as a national breed. In 1999 the FCI recognized the Czech Wolfdog as a proper breed. Anatomical and physiological differences between the hybrids and both parental forms were examined in detailed way; their capacity for training, activity and tenacity was tested. Chosen hybrids were mated again with non-related German Shepherd Puppies from the second filial generation could be trained if they were taken out of the kennels and reared individually. Hybrids of the generations F 3 and F 4 were commonly used as service dogs in the army. This is a relatively new breed of dog, which has neither hundreds of years of tradition nor the names of famous rulers or eminent personalities who bred it or owned it. Nevertheless, due to its rarity and intelligence it attracts attention wherever it appears. Nobody doubts, that these dogs are of a most distinguished origin. Their mother is Nature. The Czech Wolfdog looks like a wolf. It is tall but light and strong. Its straight thick hair is wolf-like grey with a typical white mask. It will size you up confidently, with its light eyes, set obliquely. It does not look at its owner; it knows exactly, at every moment, where its master is and what he is doing. It pays attention rather to its surroundings - it wants to have a good view. It can run a 100 kilometers easily, has a great sense of direction, and reacts with lightening speed. No trail is too difficult for it to follow. No matter whether it is raining or freezing or whether it is day or night. There's nothing it could not manage if it wants to. The Czech Wolfdog is slightly aloof, and should be socialized with people and exposed to many places when young. This makes for a flexible and confident dog. The Wolfdog tends to bond strongly with its owner and the owners family, and while not aggressive towards strangers, shy's away from them until introduced. In addition to work and play, the Wolfdog has become popular at dog shows in recent years and shows very well. During the development of the breed the tenacity of the dogs was tested. 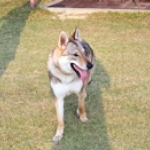 The Czechoslovakian Wolfdogs can run a hundred-kilometer distance easily at an average speed of over 12 km/h. When seeing the wolf-like appearance of the Czechoslovakian Wolfdog, people immediately ask about its character. How does the wolf origin, so evident on the exterior of the dog, influence its behavior? Is the breeding of such dogs difficult for the owner? To characterize these dogs briefly; Czechoslovakian Wolfdogs as mentioned earlier develop very strong social relation not only with their owner, but with the whole family. Moreover, they represent the "privileged position" of children and let them as well as puppies do such things they would not permit from adults and dogs. They can easily learn to live besides other domestic animals which belong to the family; however, if they meet strange animals, difficulties can occur. It is vital to sub due their passion for hunting when they are puppies. The puppy should never be isolated in the kennel; it must get used to different surroundings, to traveling and so on. The Czechoslovakian Wolfdog is very playful and temperamental; it learns easily. We can admire its all-around qualities rather than its specialization. However, we should not expect it should train spontaneously, the behavior of the Wolfdog is strictly purposeful - it is necessary to find motivation for training. The most frequent cause of failure is usually the fact that the dog is tired out with long useless repetitions of the same exercise, which results in the loss of motivation. These dogs have admirable senses and are very good at following trails. They are really independent and can cooperate in the pack with a special purposefulness. If required, they can easily shift their activity to the night hours. The independent work of the pack without the necessary control of a man was the reason for their use in the army. Sometimes problems can occur during their training when barking is required. Czechoslovakian Wolfdogs have a much wider range of means of expressing themselves and in some situations barking is unnatural for them; they try to communicate with their masters in other ways. Generally, to teach Wolfdogs stable and reliable performance takes a bit more time than certain other working breeds. Is the Czechoslovakian Wolfdog the breed for you? Every owner of any breed or type of dog should be responsible, aware, and caring. The need for proper housing, medical care, food, training and socialization are just some of the basic requirements that should be understood before any person undertakes to own any dog. • These dogs tend to be smart, alert dogs that need early, consistent training. • These dogs were developed as a type of working dog, and need reasonable activities to keep them busy. • These dogs cannot be tied to a tree or simply be left in a kennel or the backyard. They are true lovers of people and will suffer if deprived of lots of human contact. • If you are looking for a pure guard dog you may want to consider another breed , these dogs tend to be non aggressive unless they feel a real threat although they can and have been trained to be guard dogs. Many Wolfdogs have been trained to high levels of obedience and agility and have done well at obedience and agility competitions. Several have been trained in IPO sports. The Wolfdog has an incredible sense of smell, and many have proven to be great trackers and scent dogs. On the whole, the Czech Wolfdog's are a very healthy, robust breed. They were bred for this and it shows, they encounter far fewer health problems then other working breeds. They require the same level of proper health care as any dog. As far as life span in concerned, 15 years is probably about average, although an 18 year old wolfdog is not a rarity. Our thanks to wolfdog.org for some of the information used in this article.